Bring spring or filtered drinking water to Cold Brew°F in a kettle. Add 50 fl.oz. of tea leafs to a cup. Always pour boiling water over tea leafs and let steep minutes. 1) Hot water method: For 1 gallon of iced tea, bring half a gallon of filtered water to boil in a pot. Turn off heat, and add 3 tablespoons (1 oz of tea), let steep for minutes. Strain the tea into the other half gallon of cool water and refrigerate. If you want to serve immediately, you can pour the concentrate over ice to cool and dilute, then pour over ice again. 2) Sun tea: use a glass container and add 50 fl.oz. of loose tea of each cup of water directly into the jug. Then set in the sun for a few hours, tasting occasionally to get the desired strength. 3) Cold brew: The slow cold-water-steeping method extracts natural sweetness and flavor from the tea leaf. It lessens the bitterness and tangy-ness produced by tannic acid so your tea tastes smooth and mild. Add 50 fl.oz. of tea per cup of cold water and put in the refrigerator. When the water is chilled, your tea will be ready! 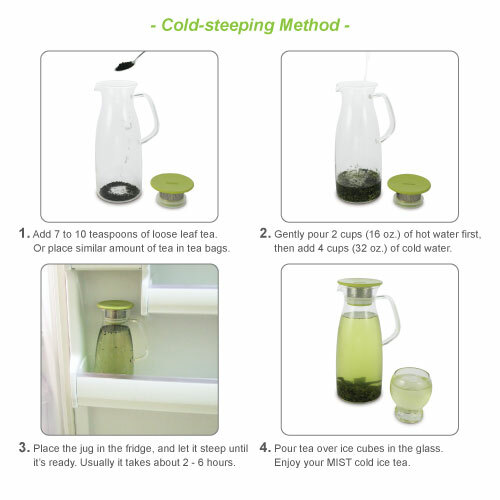 The slow cold-water-steeping method extracts more natural sweetness and flavor from the tea leaf. It lessens the bitterness and tanginess produced by tannic acid so your tea taste smooth and mild. Just make tea and keep inside the fridge until it's ready. Or, try the quick hot-steeping method if you are in hurry.